The last thing anyone wants to do right now is cook. I’m living on slices of melon, olives, crisps and a serious amount of gin and tonic. Other no-cook options include salads, ceviche (fish ‘cooked’ by lime), and bright raw vegetables. But your best friend in the kitchen during a heatwave is your blender. The blender will conjure up dips, fruit drinks and chilled soups – no need to approach the stove. 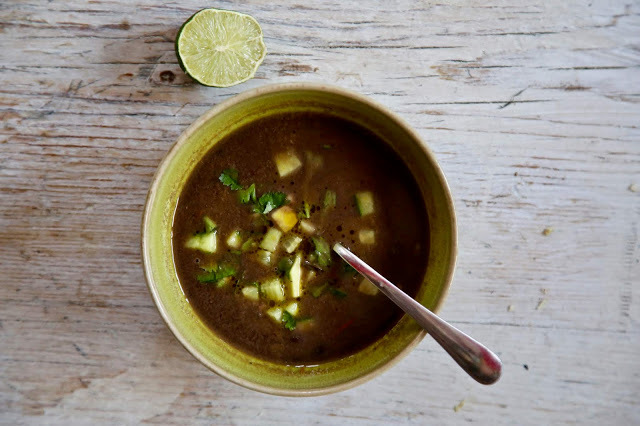 A cold vegetable soup might not sound appetising but Spanish flavours are just what you need in this heat. I can glug gazpacho by the jug during hot weather. Plus it’s an effortless way of achieving your five-a-day. From Madrid comes Salmorejo, very similar to gazpacho, but using bread. 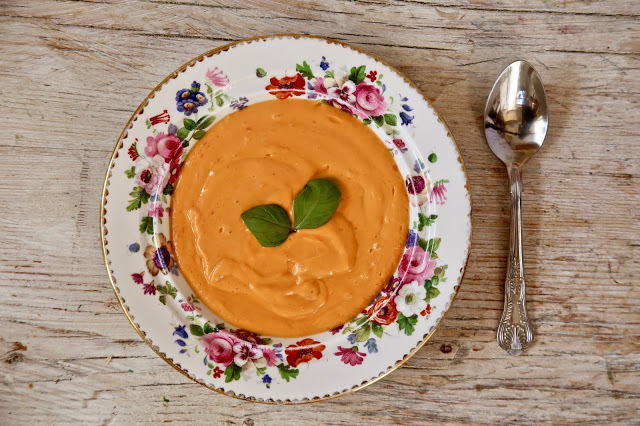 It’s a light pink colour and served in a bowl, whereas the darker-hued gazpacho tends to be served in a glass. In my recipe I added a few drops of ‘liquid smoke’ for a hint of BBQ. Ideally you’d use cold smoked tomatoes, which, using gadgets like Heston’s gun smoker, aren’t difficult to make. Finally, you can also do as the Greeks do: cook in the evening and save it for the next day’s lunch. 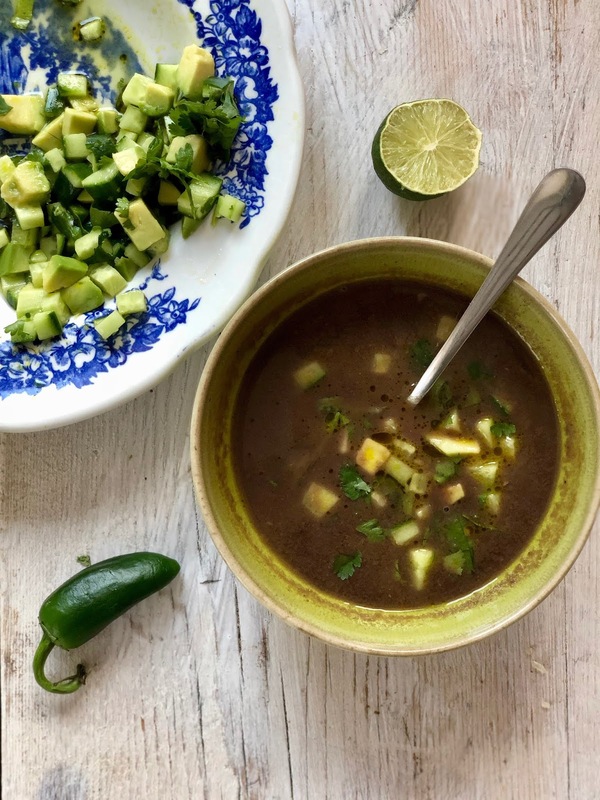 This recipe for Mexican black bean soup, which works just as well in summer as in winter, rather like a cup of tea cools you down when it’s hot. Make it the night before and heat it up the next day. To turn this into Gazpacho, add skinned green and red peppers (roasted if you wish), cucumber, and either remove the bread or use one slice. Put the tomatoes, bread, garlic and paprika into a large heat proof bowl. Cover with hot water and leave to soak. Place into a blender along with the other ingredients and blend. 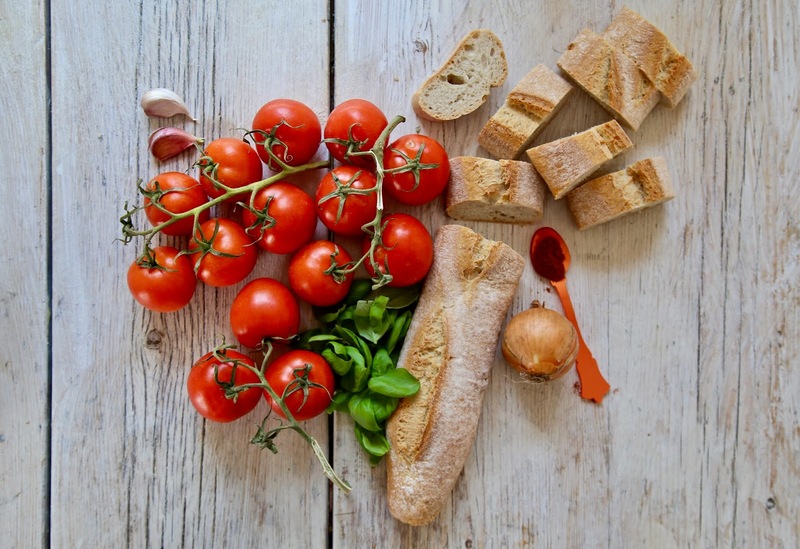 Leave to chill in the fridge and serve cold with fresh basil and a glass of fino sherry. Here your job is to cut up the vegetables in an attractive way, and get the blender out again for the dip. The joy is in the crunch of the sweet raw vegetables and the soft savouriness of the dip. Choose a variety of rainbow colours: radishes, carrots, peppers, also baby sweetcorn, mange tout, celery sticks. I like to leave some of the leaves on the radishes and carrots for a fresh garden look. Use whatever green soft herbs you have. Put all the ingredients into a blender except for the olive oil. Once blended, add the olive oil gradually while the blender is running. This recipe does require stove time – best to make in the evening and reheat the next day. The mild spiciness will cool you down. Soak the beans overnight. Cover with water, adding the poblano, avocado leaves and epazote, and cook on a low heat for an hour or two until the beans are soft but not crumbling. After the first hour, add salt. Meanwhile in a deep frying pan, soften the onions in the olive oil until pale gold. Add the garlic, tomatoes and simmer for ten minutes. Scoop out half the bean mixture and whizz up in a blender and return to the stockpot. Transfer the fried onions and tomatoes to the stock pot with the beans. Add the cornmeal and the vegetable stock. Cook for half an hour or more. Serve topped with the garnish. I love salmorejo,. 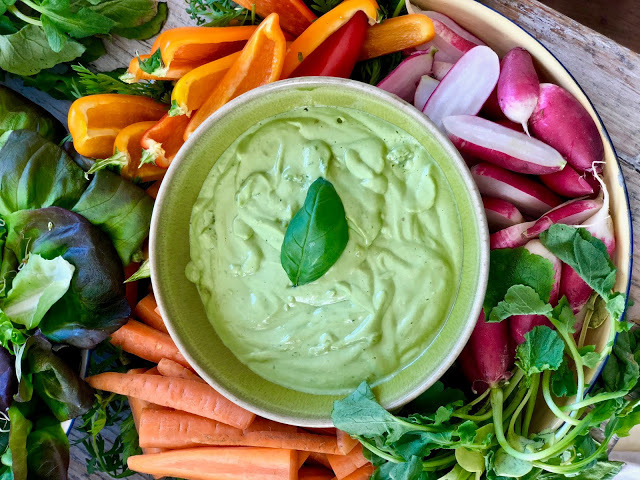 but that green goddess dip looks fabulous!